See Part 1 and Part 2 for both my disclaimer and review. This is the third and final part of the my review. Thanks for sticking with me through not just all the material but all of my tangents. The warrior is process-oriented, not outcome-oriented. They have to train like, when the fight gets here, they gotta know that, win or lose, they know they did what they could. So many people live this unfulfilled life. They're always so focused on the outcome and then when it doesn't happen the way they want, then they think everything was a waste along the way. But, man, if you've done your best, regardless of the outcome, you're going to be okay with it. I call it the warrior test. If you wake up in the morning and ask yourself, 'Hey, what am I going to do today?' and at the end of the day, you ask 'What did I do today?' If you fail that test enough days in a row, you're not going to be something. If you pass that test enough days in a row, I guarantee you can't imagine what you can accomplish in a hundred days, let alone years. Heavy, right? That was the crux of mine and so many other people's problems when it comes to weight loss/health gain. Somewhere along the time we forget that the process yields the outcome. Did we keep our promises to ourselves? The outcome just doesn't magically happen. It requires consistency as well as a degree of flexibility. Dedication is one of those murky concepts that we all kind of grok, but have a hard time putting our finger on. Spiker (with the help of Leslie Podlog) talks about determination in terms of energy -- what do we put in of ourselves toward meeting a goal? How do we muster the energy to continue changing our habits, changing our bodies, changing our lives? Spiker then takes me, already beaten up by these revelations, and then ponders the difference between reasons and excuses, finally settling on "Instead of trying to identify what's a reason and what an excuse, it really is simply about making a choice." You got me there, Spiker. Had I simply been choosing to stay away from the gym? Did my dedication waiver too far? "We like to think of dedication as emotion--as being gutsy, being loud, being grunters who push and pull and fight to reach our destination. Real dedication is quiet. Real dedication isn't about emotion; it's about cognition--about learning what to do and then thinking about the process to do it." (What some people would call "grit.") Dedication isn't a declaration, it's a resource. 10. Inspiration — [I have to admit that I was getting a little nervous about not seeing my quotes in the book. It was page 206 by the time I got to this chapter. Had I been edited out of the book?] Spiker begins this chapter by giving a few example of the people and athletes that inspire him. He then presents an interesting question -- what's the difference between inspiration and motivation (See Chapter 6 -- Motivation)? He finds an answer when discussing this topic with Art Markman -- "Motivation requires both a combination of a well-defined goal and the energy to pursue that goal. Inspiration is only one piece of the motivational formula -- the energy part." Dedication and inspiration are two things that help fuel our actions when we face obstacles or when our attention to our goals begins to fade. But unlike motivation, inspiration isn't made-to-order or manufactured; it must be sought out. Spiker quotes cognitive psychologist Scott Barry Kaufman, PhD, "... inspiration can be thought of as an interaction between your current knowledge and the information you receive from the world." Inspiration challenges us to grow. Ted Spiker is no stranger to the feedback loop that is social media (check out The Big Guy Blog in Runner's World) and the power of community (for better and for worse) when declaring our intentions regarding weight loss and health gain. It's just another way we can create an interpersonal environment to promote our success. But it's risky -- there's both support and criticism in this arena, as Spiker notes (and as I'm well aware). It relates, once again, to Chapter 6 -- Motivation. One of the most important intrinsic motivators is relatedness -- feeling connected to others. And then I see my name -- in print...in a hard-cover book. **squees** You'll just have to get the book to see what I say and know that it's only because of my readers that I had the courage to talk to Ted and let him print any of it. So thank you. I'm truly honored to be in this book, and of all the chapters, to be included as an Inspiration just floors me. 11. Connection— The subtitle of this chapter is "Truth: It Takes Others to Do It by Yourself." Spiker shares more anecdotes of how having teammates support him through a challenge/goal. This is different from competition (such as his wanting to beat Dr. Oz at basketball). It is camaraderie -- the way we honor the promises we make not only to ourselves but to others. Doug Newburg makes a poignant comment regarding Spiker's Tough Mudder team challenge, "The challenge wasn't getting over the wall. It was committing to being a part of a team. You wanted to connect with people, and that's the underling thing in everything we do. That is the goal. This is what being human is about: connecting to other people." Those connections are some of the best predictors in terms of weight loss/health gain success. I think about how much my obesity isolated me. I may have been the fat and happy person, but it was all a facade--I used my weight as a barrier to connecting to other with other people and letting them connect with me. The biggest strides I made with weight loss all happened in the presence of and with the support of my little FGvW community, friends, and family. They let me be fearless. And more importantly, they let me be afraid. They they me ask for help when I needed it. Spiker relays many different ways we can connect with the people around us, or to connect with people we are not quite connected to yet. Find your people, find yourself. 12. Resolution— "Truth: There Is No Finish Line" We can all have our interim goals, but I think most everyone's long-term goal is to have a long, healthy life. That requires all the -ologies we can muster -- not just mastering our physiology and biology. We all have to find a way to wrap our heads around the process of weight loss/health gain, and how to live in our bodies. Spiker shared one of my favorite quotes by Sri Nisargadatta Maharaj "Make love of yourself perfect." The great thing about the quote is that it's not saying "love yourself perfectly," it's asking us to temper how we act towards ourselves and how we think about ourselves. Throughout the book, Spiker addresses body image issues and the different ways they can play on our psyche. Then Spiker really raised the bar for me -- saying that I had a profound point about how we're trained to scrutinize our bodies for what's wrong: (in his worlds) "How do you tell yourself to accept your body when your body is not acceptable?" How do we "transition from beating ourselves up to bringing ourselves up?" Self-compassion/lovingkindness is hard to practice and even harder to perfect, but so very worth it. Spiker quotes studies that point to a correlation between self-compassion and oxytocin (one of the most powerful chemicals that our body produces in regards to how safe and connected we feel towards others and towards ourselves). Self-compassion doesn't mean that we make excuses for ourselves, it just means we don't beat-ourselves up for not being perfect. Spiker wants his readers to ask themselves what really matters in this whole weight loss/health gain journey. His anecdotes hearken back to the intrinsic motivators more than any number on a scale or race time. Why are we doing this to ourselves if it's not to live a joyful life? What does that look like for you? 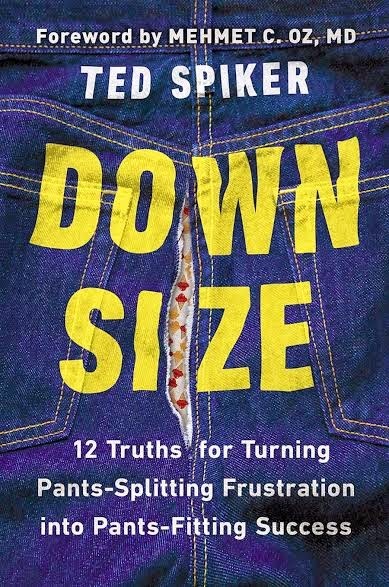 Perhaps this is the greatest lesson of Down Size -- when it comes to weight loss/health gain, maybe losing weight is just a cool side effect of reducing the amount of noise in our lives that prevents us from living authentically, living enthusiastically, living connectedly. When we get rid of what's extraneous and holding us back, what then are we capable of doing, who then are we capable of being? I don't know about you all, but I'm interested in meeting that version of me.